Published by Tau/ma Press, Rome, Italy, in English and Italian. Edition of 200; 60 pages, text and illustrations (out of print). The most comprehensive collection to date of Denes's early philosophical works, the book includes excerpts from the artist's writings. Among the projects featured are The Human Argument, Dialectic Triangulation: A Visual Philosophy, Evolution I and II, 4000 Years - "If the Mind . . .", Global Perspective, Introspection I--Evolution, Matrix of Knowledge, Morse Code Message, Pascal's Triangle, Point + Line + Intellect = Artists' Tools, Strength Analysis - A Dictionary of Strength, Studies of Time, Studies of Truth, Study of Distortions, Syzygy I and II, and Thought Complex. Published by the University of Akron Press, Akron, Ohio. Edition of 1,000, 250 signed and numbered; 50 pages (out of print). 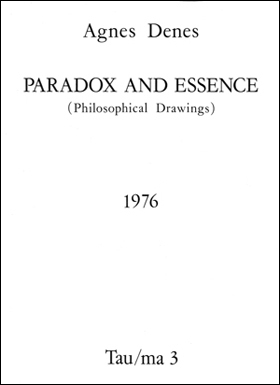 Nine original drawings were produced for the book, which also includes some of the early philosophical drawings, among them Exercises in Logic: Rice/Tree/Burial, Pascal's Triangle I, II, III, and IV, Positions of Meaning, Sculptures of the Mind, Logic Relations, and Study of Distortions. "With the publication of these books [Paradox and Essence and Sculptures of the Mind] I have allowed fragments of a constantly changing, evolving process to be arrested, frozen in time so to speak. We have sliced off a section of an evolutionary process in order to contemplate its implications. 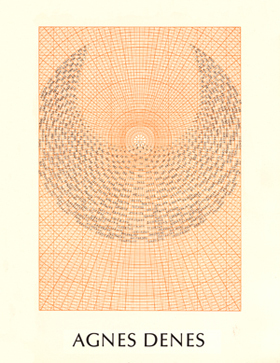 Enlarged for scrutiny, a sentence cut off from the rest of a text, motion caught in a still—the work becomes its own examiner. . . ."
- Agnes Denes, from "The Organic Notebooks," Art-Rite, 1976. Isometric Systems in Isotropic Space: Map Projections (from the Study of Distortions Series, 1973-1979), 1979 (out of print). 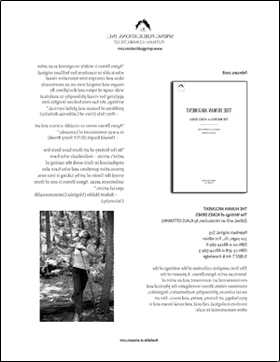 Published by Visual Studies Workshop Press, Rochester, New York. Partially funded by the New York State Council on the Arts. Edition of 200 hardback copies in silver foil, signed and numbered by the artist; edition of 600 in paperback; 100 pages, color and black and white throughout, 29 original drawings specially created for the book, 22 transparent pages. Foreword by the artist. 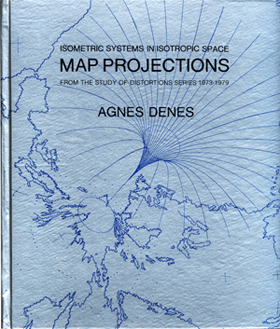 Using a map of the Earth as her point of departure, Denes employs the cartographic principles of map projection to create new world configurations. The result is a challenging and beautiful collection of images that provide a lucid inquiry into the boundaries of science and art. Many of the drawings are reproduced in color on translucent paper to convey their sequential and transformational properties in time and space. Published by Visual Studies Workshop Press, Rochester, New York. Edition of 1,100 of which 200 are signed with an original artwork. Insert ("The Debate - 1 Million B.C. - 1 Million A.D.); 200 pages, 16 full-page duotones (out of print). Denes began her compilation of data for this major work in 1972. Using dust as a metaphor and a connecting thread to facts and phenomena, she studies the human mind, our ethical values, standards of living, and survival, presenting haunting images of dust particles from outer space, such as the death of a star, distant and large objects in the universe, as well as earthly dust, including human dust, hallucinogens, poisons, chemicals, and nuclear waste. Book of Dust is a glance at the history and the future of the universe, from its violent birth to the formation of stars, the silent demise of galaxies, and the death of matter. From cosmic dust to human dust, from molecules to intelligence, this work is a cross-section of existence. Published by Spring Publications, Putnam, Connecticut. 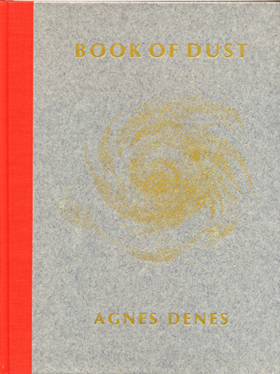 The first complete collection of writings of the American artist Agnes Denes. A pioneer of the environmental art movement and an artist of enourmous vision, Denes investigates the physical and social sciences, philosophy, mathematics, linguistics, psychology, art history, poetry, and music. Her art involves ecological, cultural, and social issues and is often monumental in scale. (text and illustrations by Agnes Denes; foreword by J. Hartz). 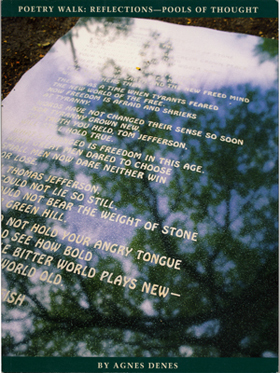 Permanent installation, embedded into the lawn at the University of Virginia; commissioned by the University and the University of Virginia Art Museum. This book documents the University's first permanent installation commissioned as a millennial project by the university. Twenty granite stones, 4' x 5' and weighing 300 pounds each shaped to resemble excavations from ancient sites were carved with writings by poets and philosophers from around the world and embedded into the university lawn. The project extends 535 feet by 65 feet. The highly polished stones reflect their surroundings and resemble pools of moving water with the words floating on top. The artist's intent was: "to lift the product of great minds from the dusty memory of the past and bring it into fruitful use in the present to inspire, motivate and enlighten young minds." Writers & philosophers: e.e. cummings, Jefferson (Declaration of Independence), Washington, Flaubert, Galileo, Shaw, T.S. Eliot, Emerson, Tolstoy, Indira Ghandi, Kant, Aristotle, Eleanor Roosevelt, Francis Bacon, etc.